ATCO believes Australia’s gas distribution network will play a key role in the future energy mix, bringing natural gas and new ‘clean’ gas, including hydrogen, to customers playing a central role in reducing energy costs and carbon emissions and an ideal complement to intermittent renewable energy like wind and solar. 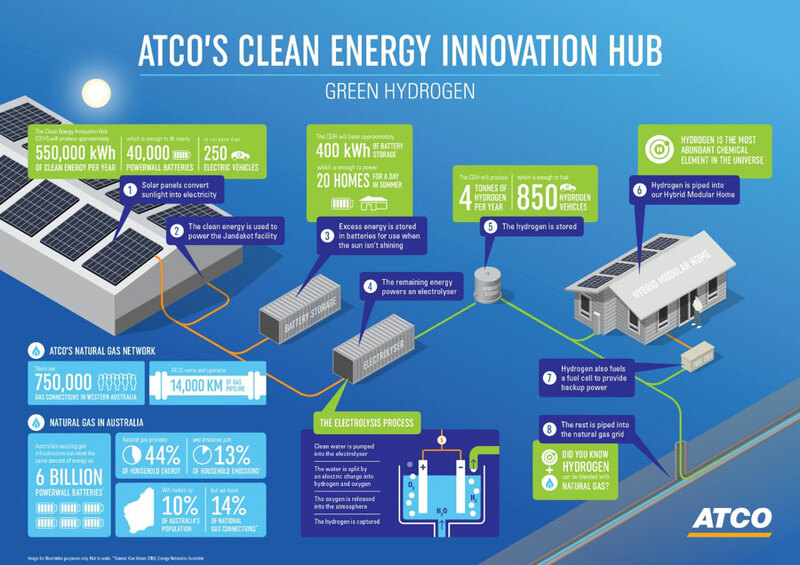 To further explore this concept ATCO is developing an industry leading Clean Energy Innovation Hub (CEIH) based at the company’s Jandakot Operations facility in Western Australia. The Clean Energy Innovation Hub is expected to be fully operational in 2019. The CEIH incorporates the production, storage and use of hydrogen, as well as the commercial application of clean energy in micro-grid systems. The CEIH will integrate ‘green’ hydrogen created by water electrolysis – using solar energy to separate hydrogen molecules from water. The hydrogen will be captured and injected into a micro-grid system at the Jandakot facility. Some of the safety and technical challenges that will be tackled by the CEIH project, include optimising hydrogen storage solutions, blending hydrogen with natural gas and using hydrogen a direct use fuel. Approximately 1100 solar panels will be installed at the Jandakot Operations Centre, capable of generating 300kW of power, which is approximately two and half times the daily power requirements of the facility. The CEIH’s design stores 400kWh of energy in batteries with excess renewable energy utilised to power an electrolyser for the production of hydrogen which can be stored or injected into the micro-grid for testing as a direct fuel or blended with natural gas. The use of excess renewable energy, which has traditionally been lost, sets this project apart from other hydrogen trials currently underway in Australia.